Nadal focuses on winning during every match. The tennis power rankings as created by Feng Rong were developed to objectively measure a tennis player’s current form. This is accomplished by weighting the outcomes so that the four most recent results count the most. 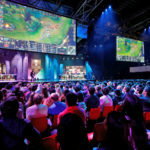 This ranking assesses the power in the men’s game as players get ready to do battle on the stately grounds of Wimbledon—this after leaving the normally dusty environment of Stade Roland Garros. In 2012, however, dust was replaced by puddles as the rains fell profusely in Paris during week two of the Grand Slam tournament, postponing the men’s final until Monday. Wimbledon, with its new retractable Centre Court roof, will be spared a troubled final in 2012 because the roof can be closed and lighting employed. Who will win this year’s Wimbledon crown? No one knows, of course. Will it be one of the top ten in our Power Listing? Only time will tell. We survey the men’s top ten in our power ranking and speculate on their potential for winning the Wimbledon championship as well as looking at some other potential winners. Last Four Tournaments: Queen’s Club [Round 2], Roland Garros [Quarterfinalist], Rome [Round 3], Barcelona [Quarterfinalist]. Will this be the year Andy Murray makes the Wimbledon final? After signing with Coach Ivan Lendl, Murray’s expectations, especially on clay, heightened. But after going out in the quarterfinals of both Monte Carlo and Barcelona, followed by a third round exit in Rome, the shine seemed to dim on the new pupil-coach relationship. It did not help when David Ferrer dispatched Murray in the quarterfinals of Roland Garros and Frenchman Nicolas Mahut sent Murray packing after the Scot’s first match at the Queen’s Club where he was the defending champion. Life for world No. 4 does not get any easier as Wimbledon begins on June 25. As usual, the pressure to win will be immense just as it is at every Wimbledon tournament as the hometown fans long to sit a native win the tournament again. No British man has done so since Fred Perry in 1936. Murray and his entourage should not panic, however, because the Scot is only 25 and has a few more years to take that next giant step—winning a major. What the world will be wondering at this point is—will it be at Wimbledon in 2012? Murray, sitting as the No. 4 seed remains fourth in line to make the final at the All-England club according to most odds-makers. The Scot has made the semifinals for the past three years. Murray has not found a way to defeat Nadal in his semifinal matches in 2010 and 2011. 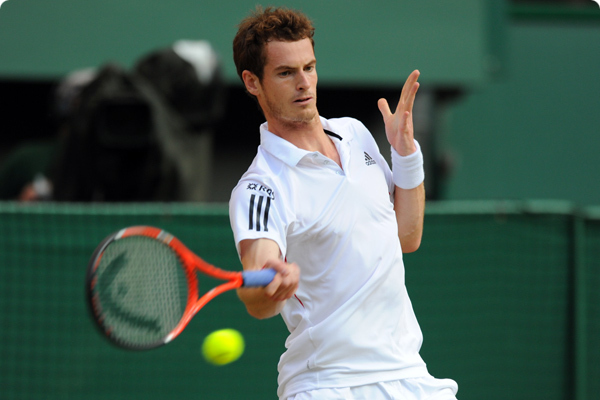 In 2009, Murray lost to Andy Roddick who advanced to meet Federer in the final. Murray almost gets to the precipice but cannot make the leap into a Wimbledon final. From his play the past two months, it does not appear that Murray will accomplish the gigantic task of winning Wimbledon in 2012. The Scot will face too much pressure and be too uncertain of his game. Last Four Tournaments: Queen’s Club [Round 3], Roland Garros [Quarterfinalist], Rome [Quarterfinalist], Madrid [Round 3]. Will Jo-Wilfried Tsonga repeat his success of 2011 at Wimbledon? After playing a stunning French Open quarterfinal match against world No. 1 Novak Djokovic, Jo-Wilfried Tsonga let the dreams of a nation slip through his fingers as he lost the battle in five sets—this after he escaped another five-set marathon with Swiss Stanislas Wawrinka. There is no athlete playing tennis with more natural ability than Tsonga who, at age 27, needs to make his presence felt at the very top of the men’s game. After injuring his finger in a fall, Tsonga was dismissed from the Wimbledon warm-up Queen’s Club Tournament in the third round. There was speculation that Tsonga would not be able to play Wimbledon in 2012 because of this injury. But all tennis fans hope this is not the case. Tsonga’s game has steadily improved and the Frenchman is now the No. 5 ranked player in the world. Most believe that his best and most consistent tennis is yet to come; but, it needs to come quickly before time runs out for the crowd-pleasing Frenchman. 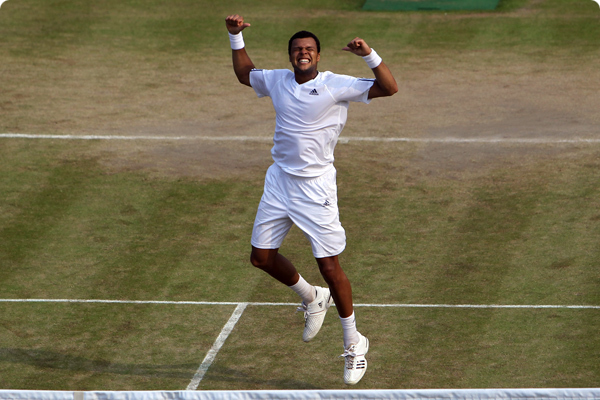 Last year Tsonga advanced to the Wimbledon semifinals after an extraordinary quarterfinal match with Roger Federer. Federer led two sets to love when Tsonga began the long road back into the match. Tsonga won the last three sets 6-4, 6-4, 6-4 to win the match. He extended Djokovic to four sets before folding. But certainly, Tsonga has the game to win it all. The question centers on his discipline and his will to win. These assets seem lacking so far. Hopefully, if able to play, Tsonga will prove all his detractors wrong. 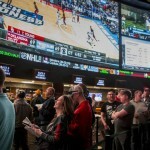 The oddsmakers remain luke-warm as to his chances to date. Last Four Tournaments: Roland Garros [Quarterfinalist], Nice [Winner], Rome [Round 3], Madrid [Round 3]. Nicolas Almagro has enjoyed a very favorable clay court season which seems reasonable since clay is his surface of choice. The Spaniard traditionally does well on the red dirt which is generally true of all the players from Spain. Unfortunately for Almagro, he met Rafael Nadal in the quarterfinals of the French Open. Although he played Nadal stroke for stroke in the first set, once Almagro lost the first set tiebreak, he faded quickly—allowing Nadal to win in straight sets. It is difficult for any his countryman to defeat Nadal, especially on clay. Almagro simply lacks the tools to defeat the world No. 2 on clay. But Almagro did well enough to break into our power rankings in the No. 8 spot. Almagro has never shown any flair or preference for the grass. In his seven appearances at the All-England Club, Almagro has not advanced beyond the third round. 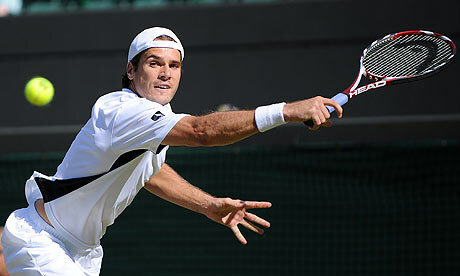 In over half of his Wimbledon entries, the Spaniard was dismissed in his opening match. A good outing for Almagro at Wimbledon in 2012 would be to make it to week two and the quarterfinals. But, even that would be a stretch. Grass does nothing for the Almagro game. Last Four Tournaments: Roland Garros [Quarterfinalist], Rome [Round 3], Madrid [Semifinalist], Estoril [Winner]. Juan Martin del Potro has slowly worked his way back into the men’s top ten. After winning the 2009 U.S. Open, del Potro suffered from a wrist injury which eventually required surgery and an extended recovery period. Since then, the Argentine has gradually worked his way back up in the rankings. Now, tennis pundits are waiting for del Potro, age 23, to regain the game he left behind in 2009 after defeating both Nadal and Federer to win the U.S. Open. This year, after winning on the clay at Estoril and making the semifinals in Madrid, the expectation was a break-through at the French Open. But after winning the first two sets, del Potro faded against Federer who came back to win their quarterfinal match in five sets. It was a disappointing result for the Argentine. Del Potro has lost to Federer five times in 2012 and has a difficult time beating any player ranked higher. 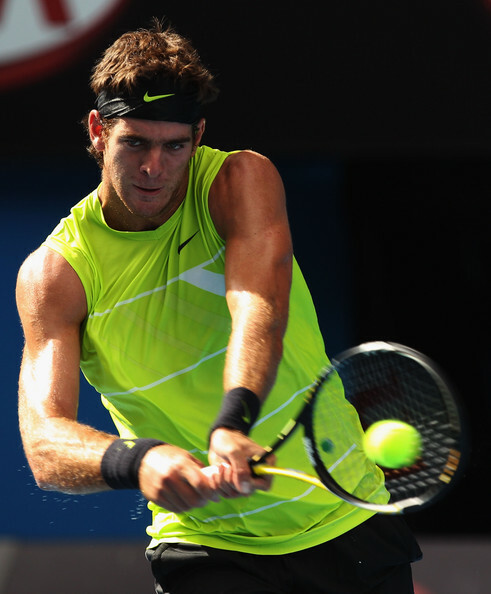 Most look for del Potro to find his range at the U.S. Open rather than Wimbledon. Del Potro has never done well on the green lawns of Wimbledon where the low bounces cause him all sorts of problems. His fourth round appearance in 2011 marks his furthest advancement in the draw to date. In three other tries, del Potro was excused in the second round. There is, therefore, no reason to expect much of the Argentine this year. Of course, without any pressure, the big Argentine may surprise a few people. But chances are, just surviving to week two would be regarded as a positive for del Potro and his team. Last Four Tournaments: Queen’s Club [Winner], Roland Garros [Round 3], Rome [Round 1], Madrid [Round 3]. Marin Cilic hope to continue his winning ways at Wimbledon. Marin Cilic was the unexpected winner of the Queen’s Club tournament when David Nalbandian was defaulted from the final after inadvertently hurting a line judge. Regardless, Cilic got the win, even after losing the opening set tiebreak. The 23-year old Croat has long been on the tennis world’s radar, as pundits awaited his break-through to the top of the men’s game. The win at the Queen’s Club propelled Cilic into the men’s top 20 just in time for the start of Wimbledon. 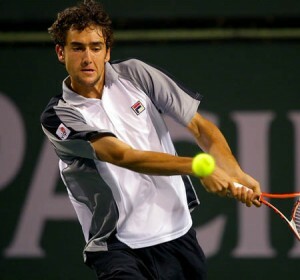 His highest ranking, however, came in February of 2010 when Cilic was ranked No. 9. He was sidelined for the first seven weeks of this year with a knee injury, missing the 2012 Australian Open. But he has been playing his way back into form in time for the summer season. Cilic shows moments of brilliance on court but normally lacks the consistency to play well for an extended period of time. Still quite young, this may the year the Croat makes his presence felt at Wimbledon and the U.S. Open. Cilic was playing some very good tennis during his campaign at the Queen’s club as he advanced to the final. There is every reason to believe the Croat could capitalize and take advantage at Wimbledon as play gets underway next week. The Croat would make an excellent dark horse to win the tournament at the All-England Club based on recent play. On the other hand, Cilic has been dismissed in the first round the past two years. Cilic is another player who may be satisfied just to make it to week two even as he hopes of more. Last Four Tournaments: Halle [Winner], Roland Garros [Round 3], Munich [Semifinalist], Miami [Round 2]. Tommy Haas stunned the tennis world by upsetting Roger Federer during the Gerry Weber final in Halle, Germany. Federer was hoping to capture his sixth title at this grass-court warm-up tournament held prior to Wimbledon. The win helped propel the 34-year Haas into the fifth spot in this current power ranking. Haas has come back numerous times in his career after serious injuries and subsequent surgeries. Once ranked as high as No. 3 in the world in 2002, Haas missed almost all of 2003 with injury. Later Haas was out for over a year in 2010 and 2011 dealing wit right hip and shoulder surgeries. Coming back this time has been a slow, tedious process but it appears to be paying dividends after the German’s results in Halle. Haas’ strength is his versatile play, able to adapt his attack to any opponent’s style. He can do it all, playing at the net volleying or rocketing his strong backhand up the line. His numerous injuries and his lack of consistency have often left Haas falling well short of his potential. Even though Haas did very well on the grass by winning the Gerry Weber Open, winning Wimbledon with its five set format will be out of reach for a man who had to qualify in order to play at the French Open. Haas’ lack of match play will be a serious detriment to his ability to win a major at this point in his career. Haas made a serious run during Wimbledon in 2009, advancing to the semifinals where the German lost to Roger Federer in straight sets. Do not expect Haas to advance that far in 2012. Last Four Tournaments: Roland Garros [Semifinalist], Rome [Semifinalist], Madrid [Quarterfinalist], Barcelona [Finalist]. David Ferrer of Spain holds the No. 4 spot in our Power Ranking. David Ferrer compiled a very successful clay court season in 2012—as expected. Aside from going out in the second round at Monte Carlo to Thomaz Belluci of Brazil, Ferrer extended his stays deep into the rest of the clay court tournaments. 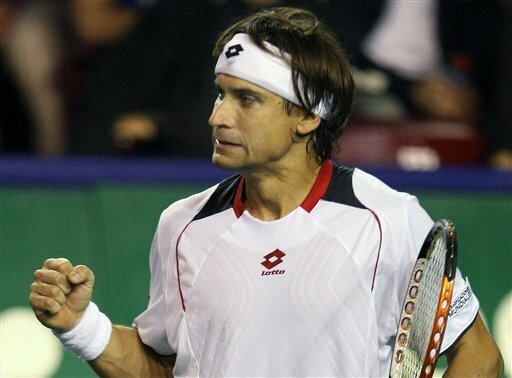 Ferrer was dismissed only when the Spaniard faced his countryman Rafael Nadal or Roger Federer in Madrid. As is true of most Spanish players, Ferrer knows how to play on clay. The current world No. 6 uses this part of the tennis season to cement his ranking in the men’s top ten. The problem for Ferrer remains beating those few players ranked above him. This week Ferrer is the No. 1 seed at the UNICEF Open in the Netherlands where he is still winning to date. It is Ferrer’s first tournament since the French Open and his first on grass. The aggressive defensive and offensive play of Ferrer makes him a very difficult opponent to overcome because the man never quits on a point until he is solidly beaten. He is known on tour as the “energizer bunny” because of his never-ending ability to play on. Ferrer enters Wimbledon as the No. 7 seed behind Jo-Wilfried Tsonga and Tomas Berdych as the No. 5 and No. 6 seeds respectively. Both of these men reached the semifinals in the past two years. In his nine appearances at the All-England Club Ferrer’s furthest advancement in the draw has been the fourth round—which he has reached during the past two years. Realistically, Ferrer has little chance to win the tournament but a better chance to improve upon his fourth round finishes—stretching his advantage into week two. No player relishes seeing Ferrer scheduled as his next opponent. No man does as much with his ability as the “energizer bunny” does on court. It remains very difficult to count him out in any match. Last Four Tournaments: Halle [Finalist], Roland Garros [Semifinalist], Rome [Semifinalist], Madrid [Winner]. Roger Federer has won the Wimbledon title six times. No man is more comfortable on Wimbledon’s Centre Court than Roger Federer. It feels like coming home to the Swiss. So far, Federer has enjoyed a very successful 2012. Aside from his early dismissal by Andy Roddick at Miami and John Isner during their Davis Cup match in February, Federer has spent much of his time winning more tournaments. He picked up more trophies at Rotterdam, Dubai, Indian Wells and Madrid. Federer was a finalist in Halle and a semifinalist in Doha, the Australian Open, and Roland Garros. The winner of 16 Grand Slam tournaments looks forward to another campaign at the All-England Club as well as the 2012 Summer Olympics in London with Tennis to be held on the same green lawns. Unfortunately, Federer never seemed to find the same form at Roland Garros in 2012 that he displayed in 2011 but that aside, his play throughout the season has been top-notch. This puts the Swiss in an excellent position to not only win his seventh Wimbledon title but to recapture his No. 1 ranking with a win on Championship Sunday on Centre Court. One thing for sure is that Roger Federer knows how to win Wimbledon championships having done so six times, including five consecutive titles from 2003-2007. Losing to Nadal in 2008, Federer came back to recapture the title in 2009 in an epic five-set final against America Andy Roddick. Yet, the past two years, Federer has only reached the Wimbledon quarterfinals upset in 2010 by Tomas Berdych and in 2011 by Jo-Wilfried Tsonga. Federer had to pack his bags, unaccustomed to leaving Centre Court so early. Federer takes a back seat to favorites Rafael Nadal and Novak Djokovic as pundits, fans and bookies look for predictable winners. Yet, Federer’s fans remain convinced that there is another win in the books for the Swiss on Centre Court. It would be foolish to overlook Federer as a possible winner at Wimbledon in 2012. His motivation? Another title would move Federer equal to Pete Sampras who owns seven championships at the All-England Club. It would also add another Grand Slam trophy to Federer’s record-setting 16 titles. Last Four Tournaments: Roland Garros [Finalist], Rome [Finalist], Madrid [Quarterfinalist], Monte Carlo [Finalist]. Novak Djokovic hopes to repeat his win at Wimbledon. After Novak Djokovic defeated Rafael Nadal at the 2012 Australian Open in a thrilling 5-set final, the Serbian camp breathed a collective sigh of relief because the world No. 1 had just won his third consecutive grand slam title—each one over Nadal. Sporting a new-found regimen for winning, including a restricted diet and self-discipline, Novak Djokovic continued his winning ways. 2012, however, did not go the way of 2011 when Djokovic remained undefeated until the 2011 French Open semifinals. It was at that juncture that world No. 3 Roger Federer ended Djokovic’s 2011 winning streak. After the 2012 Australian Open victory, however, the Serb lost to Andy Murray in the Dubai semifinals then fell to American John Isner in the semifinals at Indian Wells. Even though the Serb would come back to win again in Miami, the clay court season began and Djokovic found himself coming up short in finals against Nadal—finals that he had won just a year ago. Still, Djokovic continued to reach finals. Now, the Serb and his camp hope to recapture the magic on the green lawns of Wimbledon—leaving the clay to Nadal until another year. After wiping off the red dust of a fairly successful clay court season, Djokovic decided to skip the usual practice of warning up on the grass by entering a warm-up tournament. This is the same routine he followed a year ago. Now after a lengthy rest, the Serb will be ready to do battle on the green lawns of Wimbledon where Djokovic is the defending champion. 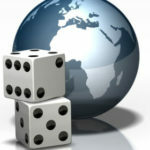 Most expect the world No. 1 to make it to the final again and there to face Nadal who is determined to win his third championship at the All-England Club. Should the two top seeds make it—the final promises to be another epic with no rain or bad light to impede their final match as happened at the French. There is much riding on the outcome, including the No. 1 ranking. Last Four Tournaments: Halle [Quarterfinalist], Roland Garros [Winner], Rome [Winner], Madrid [Round 3]. 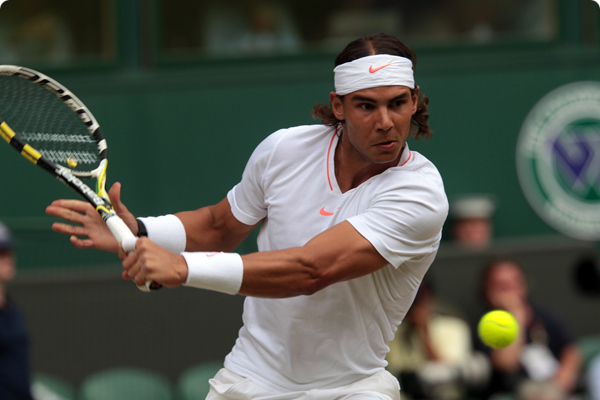 Rafael Nadal hopes to win his 3rd title at the All-England Club. After winning his seventh French Open title, Rafael Nadal comes in first in this power ranking gaining considerable momentum as the 2012 Wimbledon Championships get underway. World No. 1 Novak Djokovic overtook him for the top spot almost a full year ago. Now Nadal has ambitions to reclaim his ranking by winning the tournament at the All-England Club for the third time. After defeating Djokovic in back-to-back finals in Rome and at Roland Garros, plus an earlier win over the Serb in Monte Carlo, Nadal garnered some much needed confidence. This was something Nadal sorely needed—after Djokovic defeated Nadal in every tournament they contested in 2011. Of course, all of Nadal’s wins have come on clay where the Majorcan is considered the best. Whether Nadal can continue his clay-court dominance on grass is yet to be seen. The world No. 2 was dismissed early in his grass-court warm up event in Halle, losing to German Phillipp Kohlschreiber in the quarterfinals. Most, however, do not regard the loss as reason to be concerned. Nadal won every tournament he entered on clay except Madrid where he complained loudly about court conditions including the blue clay. The clay season renewed his confidence and his aggression and rocketed him to the top of our power rankings once again. Nadal certainly has the game to win the tournament at Wimbledon because he has won the championship trophy twice—in 2008 and 2010. The epic match with Federer in 2008 has gone down in history as one of the greatest tennis matches of all time with Nadal winning in the fading light of Centre Court, denying Federer his sixth consecutive Wimbledon championship. In 2010 Nadal defeated surprise finalist Tomas Berdych in straight sets—a far easier match than Nadal’s 2008 win. In 2011 Nadal faced his newest nemesis, Novak Djokovic who had just claimed the No. 1 ranking. Nadal would lose this Grand Slam final in four sets and not win another one until this year’s French Open. The focus of this year’s championship remains centered on a Djokovic-Nadal final. As the No. 1 and No. 2 seeds they will not meet unless both make the finals. The odds so far favor them doing just that. If so, it will be an epic duel with one of them either cementing his place at the top or reclaiming a lost No. 1 ranking. John Isner is a dangerous player on any surface. Although ranked No. 10 by the ATP, Wimbledon has seeded to top American at No. 11 behind Mardy Fish who has been injured and unable to play of late. The big serving American’s play has improved dramatically over the past year as Isner moved up the ranking ladder climbing into the men’s top ten. 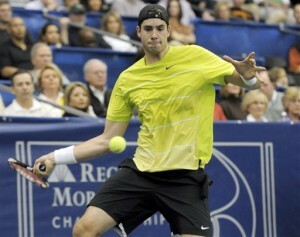 Nobody wants to face Isner on court because of his big booming serve and his powerful forehand. He is a dangerous player and capable of defeating anyone. Czech Tomas Berdych has the game to win on the grass at Wimbledon. He has proven his potential by making the finals in 2010, upsetting Federer in the quarterfinals and Novak Djokovic in the semifinals. Although he went out early in Halle in 2012, Berdych will be itching to get back into the finals once again where he feels he can finally win a major. Much will depend on his draw because Berdych will need some time to work his way through the draw. But once Berdych finds his stride, he can be impossible to stop, especially if he masters his nerves. The big serving Canadian is ready to make his mark at this year’s Wimbledon. Last year, if you recall, Raonic was scheduled to meet Nadal when the rains came. After slipping and injuring himself, Raonic had to withdraw from the tournament before he could meet Nadal in third round. This year the Canadian comes in healthy, hoping to make an impact. Much is expected of the 21-year old who loves the hard courts but shows real potential on the grass. This is another player none of the top guys wish to face early. On a surface where good serving is imperative—Raonic could go a long, long way. The Australian tennis community expects this young man, Bernard Tomic, to become their new standard bearer now that Lleyton Hewitt is fading from the top of the men’s game, riddled with injuries. Tomic showed every sign of not disappointing them until retiring early in Halle at the Gerry Weber tournament during a match with eventual champion Tommy Haas. Then, Tomic lost his way at the AEGON International tournament by losing to Fabio Fognini in the second round. Temporarily off track, Tomic will have to regroup in order to repeat his success at Wimbledon from a year ago. In 2011 young Tomic advanced to the quarterfinals after going through qualifying. There the Aussie lost to eventual champion Novak Djokivc. Hopefully Tomic can regain his form and have the impact many expect of him at this year’s tournament. The power rankings list players based on recent results. The season-long series is authored by JA Allen, Marianne Bevis and Feng Rong, whose formula provides the rankings.